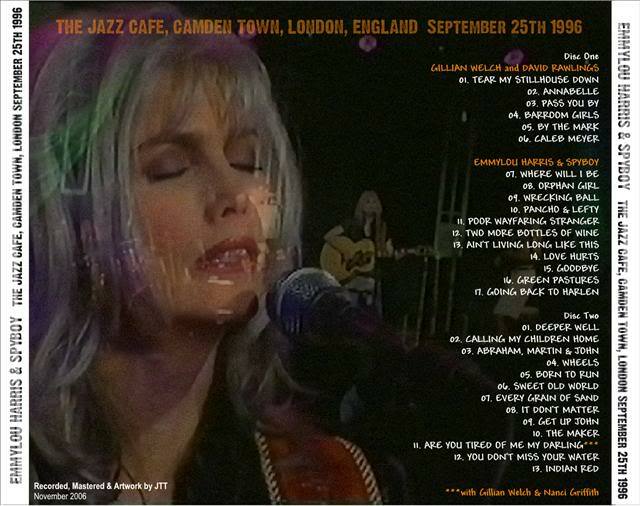 EMMYLOU HARRIS & SPYBOY plus Gillian Welch & David Rawlings THE JAZZ CAFE, CAMDEN TOWN, LONDON September 25th 1996 "JTT Master (New Transfer)"
a very respectful audience and one of the best concerts I've attended. I want to put my name in for this vine but being non computer savy I can't work it out.Can you help? There you go. Please let me have your address and I'll pop it in the mail. Makes sense to send this to Scotland first. Out to John today - 6th May. In today, thanks - out in the a.m. to Llareggub. Out to AU tomorrow Wednesday. I've recieved the disc for this.I'll keep a look in case someone else wants it.